Home > Uncategorized > Back In Stock – Mr. Clean Magic Eraser Multi-Surface Cleaner, Original, 4 Count Only $2.47 From Amazon! 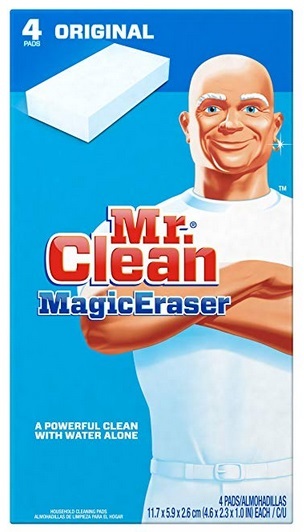 Back In Stock – Mr. Clean Magic Eraser Multi-Surface Cleaner, Original, 4 Count Only $2.47 From Amazon! April 2, 2019 Comments Off on Back In Stock – Mr. Clean Magic Eraser Multi-Surface Cleaner, Original, 4 Count Only $2.47 From Amazon! Amazon has the Mr. Clean Magic Eraser Multi-Surface Cleaner, Original, 4 Count marked down to $3.47, plus clip the $1 coupon to bring the total to just $2.47! Great for multi purpose cleaning on car windshield glass, leather athletic shoes, walls, doors, baseboards, glass table tops and more!